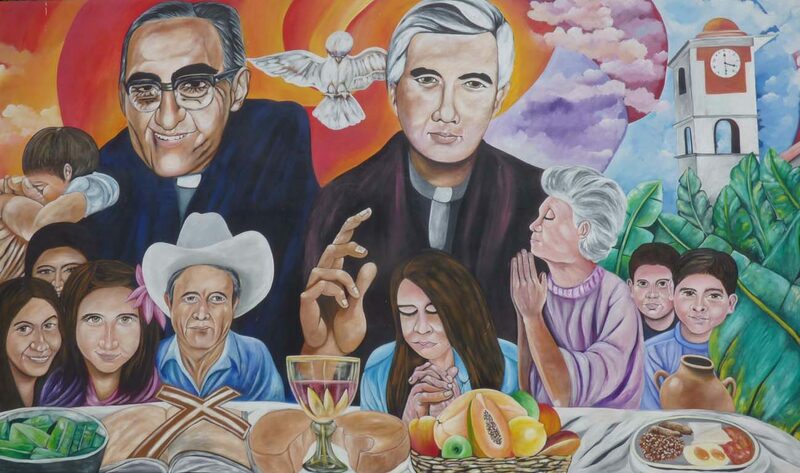 SAN SALVADOR, El Salvador (CNS) — El Salvador’s Catholic Church circles swirl these days with news about a possible miracle attributed to the intercession of Blessed Oscar Romero, one that many hope will lead to his canonization. But in the not-so-quiet whispers of hope, there’s also the yearning that the momentum will help the beatification cause of his martyred Jesuit friend, Father Rutilio Grande. Father Grande was killed 40 years ago — March 12, 1977 — while on his way to a novena. More than a dozen bullets went through his body, killing him and parishioners Manuel Solorzano, 70, and 16-year-old Nelson Rutilio Lemus. “We’re waiting” for word that will make Father Grande El Salvador’s next saint-in-waiting, said Andrea Perla, of the Archdiocese of San Salvador’s canonization department. Perla, a 20-something charged with using social media to teach others about Father Grande, said there’s a lot to learn from the priest’s exemplary life: humility, generosity, and caring for those who need help the most. Like many young Catholic Salvadorans, she said she didn’t know a lot about Father Grande, other than his association with Romero until she started reading about his life. “And I really fell in love,” she said. Father Grande, a Salvadoran from the countryside, was educated mostly in Spain and Belgium and other parts of Latin America, but returned to work among his country’s poor and rural masses. The mission teams he organized taught peasants to read using the Bible, but also helped the rural masses organize as workers to speak against a rich and powerful minority that paid them meager salaries and against the social maladies that befell them just because they were poor. Jesuit Father Salvador Carranza worked with the team of missionaries Father Grande organized, which included Jesuit priests and lay ministers. They evangelized a wide rural area in El Salvador from 1972 until Father Grande’s assassination, forming small communities that would read and discuss the Bible and subsequently other goings-on in their lives. “Gathering as a community helped them grow tremendously,” Father Carranza said in an interview with Catholic News Service. It started slowly. They began fixing a person’s home, a street, and then they organized a food co-op that helped those who didn’t have enough to eat, Father Carranza said. As the Jesuit publicly advocated for the poor and disadvantaged, others quickly moved in to silence him. “Rutilio was assassinated for believing that the poor are worth a space at the table,” said Jose Artiga, executive director of the San Francisco-based Salvadoran Human Aid, Research and Education Foundation, known as SHARE. Artiga and his wife named one of their sons Rutilio to honor the priest, who is “a symbol of struggle, a symbol of accompanying the organized poor, a symbol of giving your life for the liberation” of others. Today, the bullet-ridden shirt Father Grande wore when he was killed is one of the first items to greet visitors in a permanent exhibit at the Hall of Martyrs at San Salvador’s Romero Center, a space devoted to telling the story of the country’s wartime atrocities. The exhibit, on the campus of a Jesuit university, focuses on El Salvador’s Catholic martyrs. David Molina, a student at the university who gives tours at the Romero Center, said Father Grande’s place at the start of the exhibit is deliberate because his death marked the beginning of a terrible moment for Catholics in the country. It set off a persecution of priests, religious women and men and laity killed because they advocated for the poor in the period that produced and included a 12-year civil war that claimed more than 70,000 lives, including Archbishop Romero’s in 1980, and six of Father Grande’s Jesuit colleagues in 1989. “Walking with the poor, he suffered the same persecution they were suffering, including death,” Artiga said. For a time, little was said about Father Grande because of a “strategy of fear” that those who killed him — and who were never identified or tried — used to try to silence his message, said Salvadoran Father Luis Salazar. What Father Grande said wasn’t popular but it was necessary, said Father Salazar, adding that “the Gospel challenges us” and is not meant just to hear nice things. Salvadoran Bishop Jose Elias Rauda of San Vicente, who attributes his vocation to the Jesuit, said aside from teaching solidarity, sensibility and fraternity, Father Grande exemplified straightforwardness, which later Archbishop Romero emulated. “These were people who didn’t keep quiet” about what has happening to the poor, Bishop Rauda said. Forty years after his death, Father Grande has powerful admirers in the church. Fellow Jesuit Pope Francis is said to have asked a member of the commission pushing for the beatification of Father Grande whether there was yet a documented miracle attributed to the Jesuit’s intercession. When the answer was no, the pope said he knew of one: Archbishop Romero. It is popularly believed something inside the archbishop changed when he saw the brutal manner in which Father Grande and his parishioners were killed. Before the killings, he hadn’t publicly spoken about the deteriorating social situation in the country or abuses against the poor. Witnesses said that as Father Grande’s body was carried toward his parish, it practically came apart because of the many wounds. The incident, along with other cases Archbishop Romero knew about involving the killing of unarmed civilians, led the archbishop to take up Father Grande’s voice in defending the poor. The Vatican beatified Archbishop Romero in 2015 after determining he was killed out of hatred for his Catholic faith. Father Rutilio devotees are hoping that the Romero beatification, along with the 2013 election of a Jesuit to the papacy, can only help recognize a man they’ve long considered a saint. Father Grande is buried in his home parish of St. Joseph in El Paisnal, a town north of San Salvador, which is increasingly receiving visitors from abroad wanting to know more about the life of the priest. They include the Vatican’s Archbishop Vincenzo Paglia, postulator of Archbishop Romero’s sainthood cause, who in 2015 visited the spot where the priest and his parishioners were killed and celebrated Mass at the parish where the three are buried. During the visit he offered comments about Father Grande and Archbishop Romero. “Father Rutilio and Archbishop Romero had one great piece of wealth: the Word,” Archbishop Paglia said, according to a Diaro1.com article, adding that while some sought to “truncate” their message, with “weapons, power, fear,” they failed. Instead of silencing it, those efforts strengthened their message of solidarity, humility and caring for the poor, which still speaks to the challenges of extreme violence, poverty and inequality that remain in El Salvador, said Monica Fernandez, who is working to bring to fruition Rutilio Grande National University, a project that would educate the country’s poor. It is good What about our Black American Saints who wait in heaven for Sainthood. Our first Black Priest.